I'm not sure if you think the same way that I do, but I'm always really excited when I try an Asian skincare brand. Not only are they formulated specifically for Asian skin, they also produce revolutionary products that are always one step ahead of other brands. I discovered For Beloved One pretty recently, and was fascinated by what this Taiwanese brand had to offer. I was able to try out a few of their products and I am pretty impressed! Their packaging is neat, clean and unfussy; they are comfortable to apply (no excessive stickiness or perfume), and they are pretty darn effective. I have a new love (sorry, J!) and it is this For Beloved One sunscreen. It has amazing coverage for a sunscreen and I consider it more of a high-coverage tinted moisturiser instead of a sunscreen. I love the way my skin looks whenever I wear this - smooth, flawless and glowy! 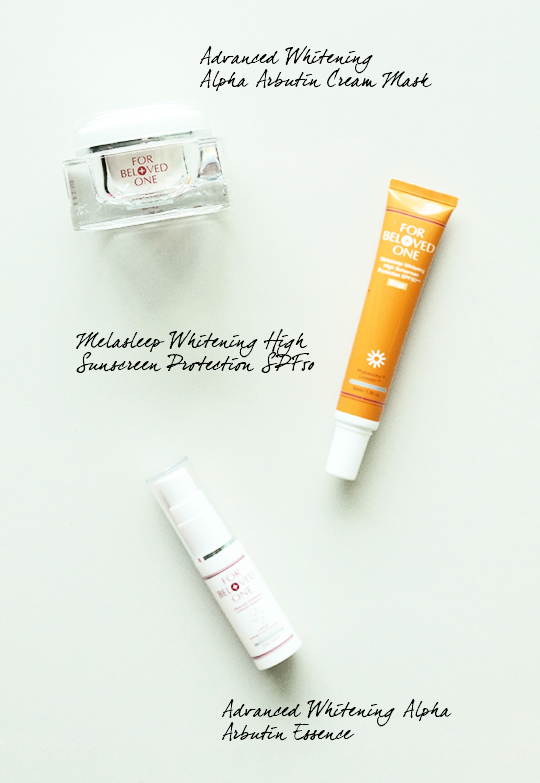 Its high SPF is kind of like a huge bonus. I love this as a low maintenance, errand-running cover-up; something I reach for when I'm just ducking out for a quick few hours and want to protect my skin and nd look presentable all in one step. If you're looking for a quick multi-tasker for easy coverage and protection, look no further. This is absolute gold. Another one of my favourite products in this range, this serum targets dark spots and pigmentation and lightens them over time. I particularly love this for my acne scars - they seem so much lighter and less noticeable to me! If you have sensitive skin that reacts badly to whitening products, I'm the exact same way, but this didn't do anything to stress my skin out. So don't give up on whitening products just yet! Grab a sample of this and give it a try - it might work for you the way it did for me! Last, but definitely not least, is this whitening mask. It brightens the skin, gets rid of any dullness and makes your skin feel like silk after you remove it. I apply this once a week in a thin layer right before bed, and leave it on till the morning, then rinse it off and start my regular morning skincare routine. After almost a couple of months of use, my skin is looking great! I feel like the use of this mask combined with regular use of the serum has lightened my acne scars considerably, and I've been able to wear less concealer, which is always good for someone who hates to do extra work when getting ready!